Funny story, other than writing movie reviews, I also write novels. Whether I finish or not is usually a completely different story, but there was this one story that I came up with that involved an accident and a comatose patient witnessing their life from a third-person perspective. I never finished it, but it would have gone into depth with how that affects them in their out-of-body state. That’s the first thing that came to mind while watching If I Stay – but, I have to say that I like the route my story would have went a bit more than how this one went. Not to say that this was a horrible movie…no, it’s not. It’s just a little slower and more melodramatic than I would have typically liked. Alrighty then, Chloë Grace Moretz plays Mia, a musically-incline cello player that has the entire world ahead of her…or does she? Turns out she gets thrown into a car wreck and is immediately sent into a coma. Only problem is…she wakes up in an out-of-body experience where bad things after bad things keep happening around her and she has to decide whether to stay or to pass on. I love the idea of patients experiencing life in the phenomenon of an out-of-body experience (OBE). I love it, which is why I try my best to find these things where I can – because in my opinion, there’s a lot of potential in OBE films. One of my favorites is a movie called Awake – where the patient is unknowingly awake during open heart surgery and can feel everything – what’s more – his doctors are planning to kill him for the life insurance money because he’s rich. It’s gritty, it’s chilling, it’s creepy, and in a certain light, it’s believable. 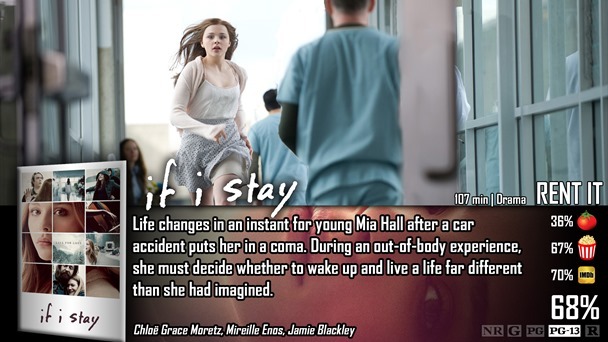 If I Stay is…melodramatic and takes a different route than I would have expected…well…anyone would have expected. It takes a lot of time going back and forth from her OBE and from her life before it, leading up to the actual event. That’s fine, I have no problem with flashbacks, but the problem with these flashbacks are that they are boring and there’s not one iota of plot development that I really care about in these scenes. It’s a typical family drama with teenage romance that has its basic ups and downs…its really just slow and conventional…and I feel like I’m losing the point of these scenes. The only real interesting element of the film is this paranormal aspect of the OBE, and even that has uninteresting elements to it. These scenes are fine in theory, but they rely heavily on emotional performances. What’s more – they rely heavily on emotionally shot scenes. That means not only the performances need to be realistic and believable, but the flow of these revealing scenes needs to grasp the audience and throw them for a loop. This film has trouble with that. The first emotionally-important scene in the movie is really just revealed matter-of-factly, and because of that, Chloë’s acting as far as reactions probably didn’t click as well as it should have with some audience members. Now, I like Chloë Grace Moretz. I think she is a very promising actress that knows how to pick a role. For her age, she has already proven her abilities in acting as she has picked roles from comedies, action films, dramas, and even dabbled in horror. She knows her stuff, and plays a really good, likeable teenager. She does great here as well, but I have to say that I have seen her before in better roles that I feel suited her more efficiently. However, Stacy Keach plays her grandfather and my god, that man can act in anything he is given. In my opinion, he is the best actor in the movie and needed more screen time. I think for the most part, this movie just needed to have a little more focus from the OBE side of things. That’s not because I prefer movies like that, it’s because in this specific story, that was the most interesting element. Her life before didn’t seem to be having any set direction other than a basic coming-of-age tale that seemed pretty separate from her experiences in the hospital. That’s the problem…they didn’t feel that connected other than the obvious fact that Chloë was playing the same role in both scenarios. So in a way – it felt unbalanced. There is quite a bit of potential in this film, as it takes the ever-intriguing out-of-body experience as a twist on the basic coming-of-age tale. It needed more out-of-body experience scenes, and the emotional scenes needed to be written, performed, and shot differently than they were…because as it stands, I felt separated from the movie and any of the characters – and that should never happen in any movie experience.